Madison County Courthouse, Winterset, Iowa. More famous for their covered bridges, Madison County has some other notable structures - not the least of which is their beautiful limestone courthouse. Like thousands of early county seats across the country, Madison County's first courthouse was a log building (1849). 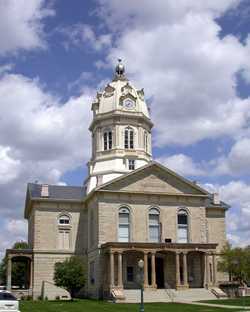 The second courthouse (no date available) was constructed of stone. Not unlike many courthouses of the period - jail cells were incorporated into the design. In this case, the prisoners occupied the second floor. In 1875, Wintersetters were making plans for celebrating the nation's upcoming centennial the following year. But their second courthouse caught fire and in four hours it was a complete ruin. They spent 1876 building their third courthouse on the foundations of the second. 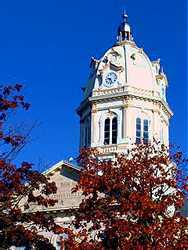 The third courthouse was built of locally quarried limestone and erected precisely in the center of the county. 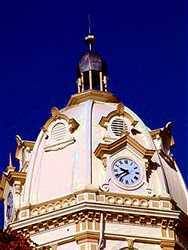 For $120,000 the people of Madison County got an oversized dome, four clockfaces and even a 1500 lb bell. The building's height has been given as 122 or 135 feet - close enough not to argue. The style is said to be Italianate-Revival and it is proudly listed on the National Register of Historic Places. Photographer Ken Rudine was in Winterset attending Madison County's annual Covered Bridge Festival in October of 2005 when he took these photos to share with our readers. The courthouse dome here is strikingly similar to another of Ken's courthouse photos (Presidio County Courthouse in Marfa, Texas).